Mexico begins a new chapter its first matches under Tata Martino, who looks to instill his style on a national team in transition and one looking ahead with big ambitions. The beginning of a new era for Mexico's national team arrives this week, as Tata Martino’s reign with El Tri officially gets underway this Friday night against Chile in San Diego. Next Tuesday, Mexico will stay in California but travel north to Santa Clara as Martino faces Paraguay, the team he coached to the World Cup quarterfinals in 2010. It takes on added meaning given it will mark a reunion with two of his former Atlanta United players, Miguel Almiron and Tito Villalba. But rather than reflecting on past achievements, this stretch for Martino is about the present and Mexico’s first preparations towards the Gold Cup and beyond. Back in January, during his first official press conference, Martino emphasized that aside from nurturing the squad’s obvious talents, his biggest objective is to create a team that can work cohesively under his tactical system. These friendlies, therefore, should show us the first stages of this system, and given Martino’s philosophy and resume, it's fair to predict El Tri will look to play at a high tempo with an emphasis on directness when going forward. So the other question remains: Who are the players who will draw his focus? Martino called on 28 players for this squad, mainly focusing on talent that plays in Europe and Liga MX. Jonathan dos Santos, familiar to Martino from their days at Barcelona, is the only MLS representative, as Carlos Vela and Marco Fabian miss out. The biggest shame is Porto’s Jesus “Tecatito” Corona who won’t make it due to a minor ankle injury. Corona fits the Martino mold–he's offensively fearless and creative–so it would have been exciting to see him worked into the manager’s plans. His absence has struck a chord with Martino, who ripped the player and promised repercussions after Corona withdrew from camp despite initially saying he'd come, even if training or playing were unlikely. "He didn't have to train or play if he couldn't, but we needed him to be here," Martino told Mexican media on Tuesday. "At first he said yes and then on midday on Sunday, he called to say he'd thought about it and that his ankle wasn't right and that he preferred not to travel. ... Like I say, no one goes gun in hand asking them to come in and when they decide not to come we move on and keep going with the group that does want to be here." With Corona's decision sorted and a strong focus on European experience and domestic talent, Martino begins his tenure by aiming to create a clearer sense of chemistry as the summer nears. After another round of 16 exit at the World Cup, this is a new beginning for Mexico, a journey of becoming not just the best team in Concacaf again, but a major competitor on the international stage. On Friday against Chile, after the starting lineup comes out, Mexican fans will frantically break down the manager’s formation and what it all means in terms of shape. Will Mexico play a 4-4-2 like Martino’s Paraguay, or a 3-5-2/4-3-3 like Atlanta United? 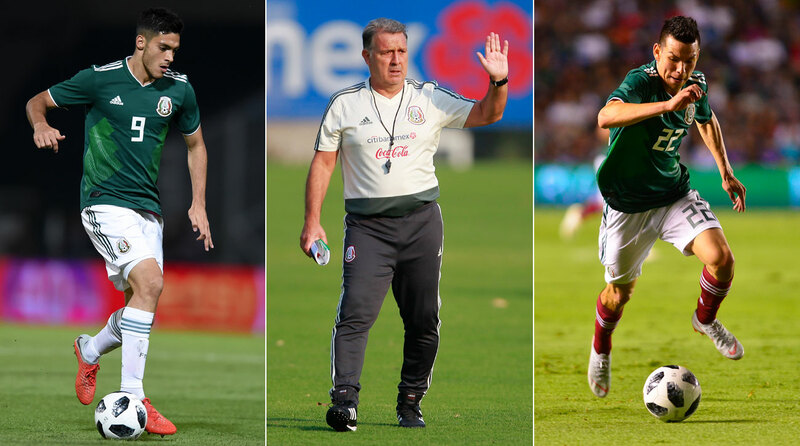 Obsessing with shape is, at least at this stage, not as important as seeing how players perform when in possession or in defensive transition (Mexico’s Achilles' heel under Juan Carlos Osorio) and how well they do the simple things. Martino’s first task at this point is to see how well these players move the ball, protect their goalkeeper when the opponent comes forward and how aggressive they are in the final third. Consequently, this is a big test for the younger crop, as Monterrey’s Cesar Montes, Cruz Azul’s Roberto Alvarado and Diego Lainez from Real Betis have a great opportunity to show the manager that they belong on the senior international stage. Luckily, it’s a good time to play both Chile and Paraguay, as they are also going through a similar issue. This window brings challenging, albeit passable tests for the internationally inexperienced members of the squad. Raul Jimenez is having an incredible season with Wolves, with 15 goals in all competitions for the Premier League side, while Javier “Chicharito” Hernandez, Mexico’s all-time scorer, is coming off a great weekend after his brace grabbed a dramatically late win for West Ham against Huddersfield. Those are the only natural No. 9s in Martino’s squad, with the rest of the attacking firepower better suited as wingers such as Hirving “Chucky” Lozano, Chivas's Isaac Brizuela and Lainez, so the consensus is that both Jimenez and Chicharito won’t be on the pitch at the same time, at least not to start. Despite Chicharito’s reputation, it would seem that the 27-year-old Jimenez should start on Friday, as his game has elevated since playing in the Premier League, especially in terms of his mobility and vision. If Corona seems as the type of player suited for a Martino system, the same could be said for Lozano. The PSV star, who has scored 19 goals in all competitions this season (including four in the Champions League qualifying and group stages), is not only a direct threat on the wing, he also loves to enter the danger zone and pounce on any loose ball inside the box. At the World Cup, Lozano often delivered, specifically with that goal against Germany, but due to the team's occasional limits in the final third under Osorio, the 23-year-old was left with room to improve on the international stage. Now, with more experience in Europe as he's about to complete his second season with his Dutch club, this is the time for Lozano take off, and what better person to help him do that than Martino?